Johannes Evanglieus West, 1786 – 184? Leave a Comment on Johannes Evanglieus West, 1786 – 184? My fourth great grandfather on my mother’s father’s side of the family was Johannes Evanglieus West (Wiest, Weist or Wust) He was born in Hechigen, Wurttemberg Germany, January 28, 1786. Around 1824, Johannes and his wife Susanna (Haugh) immigrated to the United States with their children, Ulrich, Aldinger, and Petrus. By the early 1840s they had settled in the Clarion County, Pennsylvania area. According to an article written about Ulrich West in “A Century and a Half of Pittsburgh and Her People,” Johannes’ (John) death was caused as the result of an injury inflicted by an unruly horse. It seems that Johannes was a blacksmith. From Census records, I could tell that the death had to have occurred between 1840 and 1850. 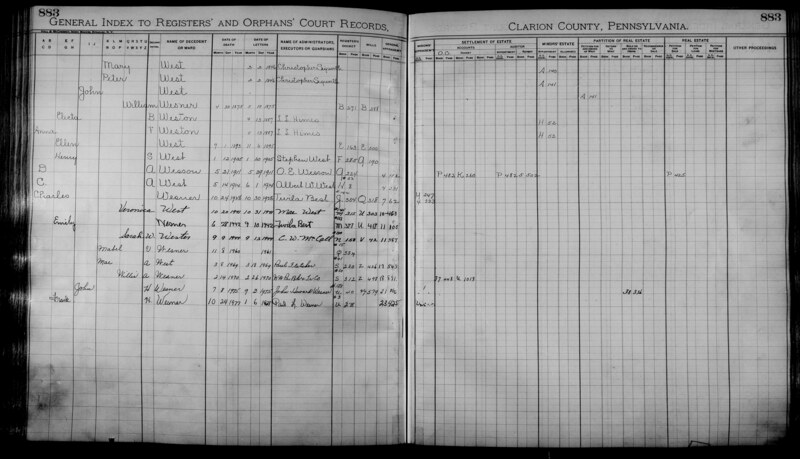 In the 1850 Census, Susanna is living in Washington, Clarion county, Pennsylvania her daughter Mary, who was born in Pennsylvania around 1833. Familysearch.org would provide another document that would help to narrow down the death date to some degree. By hand searching the Pennsylvania Probate records, 1683 – 1994, for Clarion county, there is a record in the Register’s and Orphan’s Court record index 1840-1891 Mi-Z for a John West, orphan children listed as Peter and Mary, letters date February 2, 1846. No death date is listed for John West. The administrator, executor or guardian is listed as Christopher Sigworth (Seigworth). There is only a minor’s estate document number and page, no will information is listed. Although Familysearch has a lot of Pennsylvania documents available that you can manually search through, they do not have the minor’s estate documents. I searched for (Johnathan) Christopher Seigworth in the Clarion county area and found him, born around 1805-1808 in Germany, so I am pretty sure I have the correct John West and children. Peter didn’t get married until 1850, so that would leave him in the household during 1846. I lose track of Mary once her mother dies, post 1850 Census. Christopher Seigworth and Susanna West were living just 2 houses apart according to the Census. Ulrich, my third great grandfather, would move to the Butler county area and die there in 1900. His brother Peter would move to Mckean county and die in 1904. I lose both Susanna and Mary after the 1850 Census. After 1850, either Susanna died or remarried and I haven’t found any documentation on a marriage for Mary.